Garrett Wonders was a naval officer, nuclear engineer, cyclist, teacher, Olympic hopeful, son, friend and husband. Garrett is remembered for the way he lived and the positive impact he had on the lives of others. Off the bike, Garrett was unassuming with a perpetual smile and a sense of balance. On the bike, he was remarkably encouraging to others when training and fiercely competitive when racing. He was an encouraging, inspirational character who remains so, forever in our hearts. 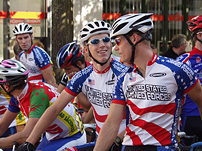 View this bicycle safety PSA, produced several years ago by the Garrett Wonders Memorial Fund.